I recently purchased a Chromebook (ARM). It has an SD card reader and a USB 3.0 port, but I have neither an SD card nor a USB 3.0 flash drive! If I were to boot from Ubuntu on one of those two devices, which would give me better performance? Which should I purchase? I would like to answer about transfer rate. 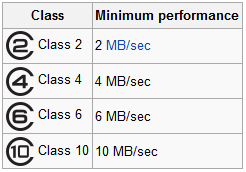 There are currently three speed modes defined by the latest USB 3.0 specification. They are SuperSpeed, Hi-Speed and Full-Speed. The new SuperSpeed mode has a transfer rate of 4.8Gbps (600 MB/sec). While the specification retains Hi-Speed and Full-Speed USB mode, commonly known as USB 2.0 and 1.1 respectively, the slower modes still operate at 480Mbps (60 MB/sec) and 12Mbps (1.5 MB/sec) respectively and are kept to maintain backward compatibility. Check out this page for a comparison between USB 3.0 and other competing interfaces such as eSATA, FireWire 800 and Thunderbolt. I suggest you to use flash drive to boot. I think there is perhaps, I say perhaps, an over riding consideration on the selection. The class level for the SD Card is there because it is basically saying these are the read/write speeds of the memory on the SD card. It is not an IO speed limitation. The USB stick issue/specification that is being sited is indeed the actual data transfer rate capability. HOWEVER, it does NOT say anything about the capability of the actual media on the two sides of the USB interface. So my thought on this is, we have to dig a little deeper! On the USB stick is Flash Memory - basically the SAME memory types, with the same limitation as the memory on the SD Card. So - this means that if the Memory on the USB 3 Memory Stick in Class 10 then that will be the limitation. If the memory on the USB 3 stick is Class 2 then that will be the limitation. Basically - we can NOT assume that because the interface is USB 3 that the transfer rate will be the same as the USB 3 specification - in this case. I would also submit that if Memory, for use on a USB stick was actually much faster - then it would very likely be available on an SD card - as Class X (super fast). A USB 3.0 Flash Drive is almost always preferable to an SD Card when booting an OS. The thing about booting Operating Systems is that 4K Read/Write Speed dictate the experience more than the sequential Read/Write Speed (the usual advertised speed). Unfortunately, most USB manufacturers don't give a baseline speed for 4K Read/Write and the only thing SD Cards have to have is a minimal sequential write speed (the Speed Classes 4,6,10, etc). Therefor, you have to test the drives you want to use yourself using bench-marking software (such as CrystalDiskMark, etc). Generally speaking, any USB 3.0 Flash Drive from a fairly reputable manufacturer will easily outperform any SD Card in both Sequential and 4K Read/Writes. In my experiences I've had MicroSD Cards that struggled to even reach the Speed Classes! One last thing for other people to consider is the available amount of USB ports and their Generation. You might find that your computer may only have 1 or 2 USB ports, so you wouldn't have room for other peripherals. P.S I have found that Amazon reviews for any particular Flash Drive/SD Card usually contain some Benchmarks to gauge overall performance. Not the answer you're looking for? Browse other questions tagged usb sd-card chromebook or ask your own question. How do I find out whether my system has USB 3.0 ports? Upgrade to 16.04 breaks USB SD card reader: how to fix?